Wine has been produced in China for over 7,000 years according to current archaeological evidence, with multiple grape varieties native to the vast country, 4th largest in the world by land area. Vitis Vinifera grapes and new irrigation techniques are thought to have been introduced to what is now Xinjiang in Western China by Greek settlers in the 4th century BC, introducing European methods of wine production. In fact, in the Northern Tarim Basin of Xinjiang, the city of Turfan located along the Old Silk Road was noted by Marco Polo in the 1200’s as producing “fine grape wine”. 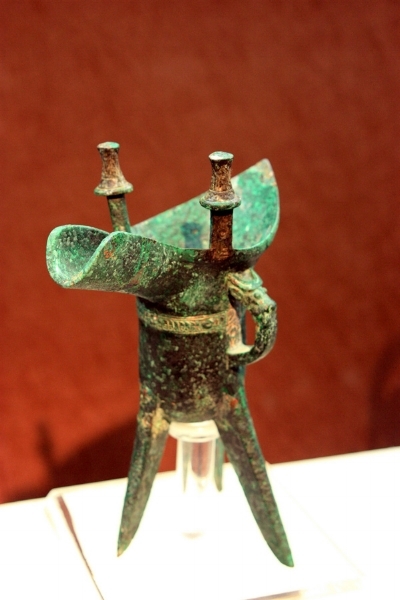 During the Shang Dynasty (1766BC-1111BC) many wine vessels (called Jue) were made from bronze & were used both for decanting wine and in religious rituals. The oldest operating winemaking company in China is still the largest; Changyu Winery has now spread it’s wineries across the country since it was founded in 1892 in Shandong Province. While modern styles of wine have only recently become popular in China, consumption and production has multiplied significantly in just the last two decades alone. Wealthy Chinese and International companies are investing heavily in the development of new wine regions and their associated industry and tourism benefits will surely allow for Chinese wine quality to improve rapidly as each year passes, and the winemakers themselves learn more about their unique landscapes. Winemakers in China, whether born domestically or hired from international talent pools, are now constantly seeking out new terrior & techniques that will truly make Chinese wine a force to be reckoned with in the years to come. China’s grape varieties will vary somewhat per region, but red varieties have been the most popular for domestic production (around 90%) as well as consumption when it comes to imports. Particularly Cabernet Sauvignon. This has been well-liked in China going back to the days of the first imports of wines from Bordeaux, France, which still remain significant today. Cabernet Sauvignon, Merlot & Cabernet Gernischt (Carménère) are popular throughout much of the nation’s dry and warm wine regions. 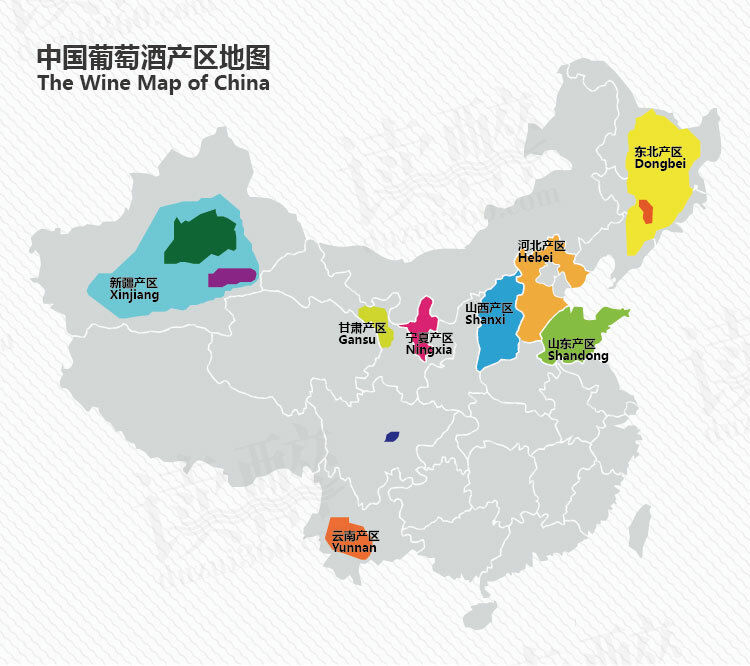 Additionally, Chardonnay has done well in Shanxi, Syrah-led blends in Hebei and in Dongbei there are even regions suited to producing Icewine styles. Marselan, a crossing of Cabernet Sauvignon & Grenache has also recently found success throughout China's upcoming wine regions. Ningxia is a small and slender region in Central Northern China and has become known over the last two decades as the hope of Chinese wine, with major viticultural projects by producers both domestic and international, large and small alike. Ningxia is China’s 3rd least populous region with less than 4 million inhabitants, yet the capital Yinchuan lies right besides the famous Yellow River (Huang He) that along it’s length became on of the cradles of China’s vast civilisation. To the West of the city lies the isolated Helan Mountains, which just manage to hold back the vast, severe deserts to the West and North. In the foothills of this mountain range is here we will find what some to believe the best terrior in China for quality wine production. The major drawback in Ningxia is the freezing Winters, when temperatures often fall below -20°C which means the vines must be buried in soil to survive the Winter and are not expected to live long lives beyond a few decades. New trellising and viticultural techniques are being developed to combat this issue. Cabernet Sauvignon and it's blends are most popular here and winemakers are now able to consistently ripen the variety to produce rich and supple reds that may indeed be age-worthy. The Shandong Peninsula has long been the modern home of Chinese wine making, which due to it’s abundant sunshine & proximity to the Bohai Sea, allows for moderate temperatures (no need to bury the vines here) and give winemakers the possibility to produce large quantities of wine. Most of the major growing regions in Shandong are around Yantai and at the coastal area near Penglai, which has long been famous for it’s apple crop. Much of Shandong Province is effected by monsoons, and as such fungal problems, rot and disease issues all need to be taken into account when growing there. Many quality producers grow on South-facing sloping hillside sites with adequately draining soils to help mitigate some of these challenges. Wine in Shandong was pioneered by the Changyu Winery in 1892 which is both the oldest and largest wine company in China with wineries located in several provinces. Around a quarter of China’s wineries are based in Shandong with both domestic and international wineries continuing to invest in the region. The Shanxi region is known for it’s clean, clear air and distinct seasonal variations, with vineyards often located at high elevations (700m/2300ft+). A part of the vast Loess Plateau in Central Northern China with loose, highly-eroded windblown soils that offer exceptional drainage, with the roots of grapevines even offering stability to such delicate soil. Current viticultural interest is primarily located in the centre of the province with one of the founding vineyards of Shanxi, Grace Vineyards located in Taigu county located near Taiyuan, the ancient capital of several Chinese dynasties and current capital of Shanxi province with over 2500 years of urban history. Notably for this region in 2013, world famous wine writer Jancis Robinson named Grace Vineyard as the top winery in China at that time. Several varieties are grown here including Cabernet Sauvignon, Chardonnay, Cabernet Franc & Marselan. Check out an excellent video from Grace Vineyard showcasing their winery and vineyard here. A Vineyard growing for Grace Vineyard in the distance is hidden the nooks and crannies of the Loess Plateau - Shanxi Province. Hebei Province surrounds the capital Beijing on 3 sides and also separates Shanxi and Shandong Provinces. With mountain ranges spread throughout the province there are several micro-climates, though the production has often been centred either close to the capital or close to the moderating influence of the Bohai Sea. Two major areas of interest have surfaced in the last several years, Changli county, near the ocean and North-West of Beijing in the Huizhuo Basin, with vineyards around the central mountain town of Huailai, becoming well-regarded in recent years. Changli county especially has seen much investment recently as it features a wide range of geographical factors including coastal and inland plains punctured by many small, steep hills and mountain ranges. This is allowing for many wine companies new and old to grow many grape varieties in the moderate region with 4 distinct seasons, and without the intense cold, humid heat or rainfall of other areas. 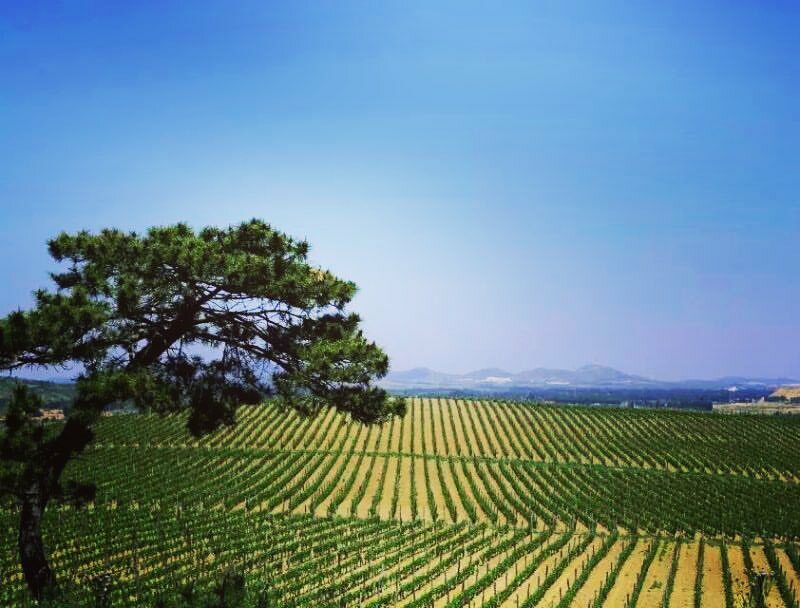 Huailai in the Huizhuo Basin is located around 2 hours North-West of China's capital Beijing and has several prominent companies involved including COFCO (Great Wall), whose Sungod vineyard label features the winemaking consultation of world-famous Bordeaux oenologist Michel Rolland. This region lies upon the ancient Silk Road trade network, that saw modern grape varieties and wine-making introduced and encouraged by travellers & merchants (including the Greeks) as early as the 4th century BC, adding to the native wine making traditions that are believe to date back over 7,000 years. Xinjiang can be a harsh place to grow wine with several large deserts covering a majority of the territory, and irrigation network supplied by spring snowmelt required in most places to produce a successful crop. Vineyards here are mostly based in the North around the Tianshan Mountain ranges, which offers more ample rainfall and climatic diversity allowing for slower ripening and more complex wines. This areas of interest in this regions are the landscape around the capital Ürümqi, the Turpan Basin area including Hami, the Yili Valley and Yanqi, with significant growth of Cabernet Sauvignon, Cabernet Franc, Chardonnay and even Syrah ongoing. The Dongbei region represents the far North-East corner of China and is spread across 3 provinces, namely Heilongjiang, Jilin & Liaoning. This region of China, that in places borders Russia & in others North Korea, has incredibly cold winters often below -30°C which means vineyards must be sheltered, and vines must often be buried in the Winter. Varieties need to be cold hardy to be successful in Dongbei, so indigenous grape species like Vitis amurensis fit the bill and have also been crossed with classic Vitis vinifera varieties to create more suitable grapes for the frigid temperatures. Easily most lauded in Dongbei would the beginnings of an excellent 'Icewine' culture, were grapes are allowed to hang until the first snows and are then harvested while frozen to produce luscious dessert wines in "Golden Icewine Valley" located beside Huanlong lake in Liaoning Province. Yunnan is located in the far South-West of China, where the Himalayas descend into South-East Asia. A land of mountains and valleys, where even at thousands of metres above sea level you can now find new Chinese vineyards starting to crop up. Vineyards were first planted in these lands during the 100 years French missionaries spent in Yunnan (1846-1952), and the resulting wines were used for sacramental purposes, however after their departure, most of the vineyards were abandoned. A couple of the new vineyards are set-up by those that know a good place for vines when they see it, with brands such as Moët Hennessy and the Sino-French joint, Xiaoling Estate already winning awards for the wines produced from their small sites. Moët Hennessy's 'Ao Yun' vineyards are located at the foothills of the sacred Meili mountain at elevations between 2200m-2600m(7215ft-8530ft) with 30ha(75acres) of grapevines split across 4 nearby villages, and comprising of 314 individual parcels. Both Ao Yun and Xialong Estate are located along the Upper Mekong River on spectacular terraced sites with towering peaks above, and the elevation providing extraordinary UV exposure for the ripening grapes. Conditions are often dry despite the area being effected by the Monsoon season, with little botrytis or mildew. Most grown so far are Cabernet Sauvignon-led blends. Gansu Province is found in the North-West of China with Xinjiang to the West, Ningxia to the North-East and it's wine-growing region of interest is found along the Hexi Corridor, the most important part of the ancient Silk Road, that connected Central Asia to the rest of China. The corridor connects a series of oases and is bordered by the Gobi Desert to the north and the Tibetan Plateau to the South, regions with little hope of ever sustaining viticulture. Due to it's sheer distance from modern population centres, vineyard growth has been slow in Gansu, but recent archaeological discoveries showing ancient winemaking efforts in the region, have stirred up interest in the Hexi Corridor and it's potential for quality wines. Much of the interest is centred around Wuwei city and it's surrounding region, which in 2012 was named as China's first "wine city". Well-regarded from Wuwei is Mogao winery which has performed a rather impressive feat in growing the fickle Pinot Noir grape as their flagship variety, despite the challenges of a desert region with less than 200mm(7.8inches) of rainfall annually. Water for irrigation is supplied by snow-melt from the surrounding mountains especially the Qilian Mountains, and due to the desert climate and elevation, there is a significant diurnal swing in temperature with hot days & cold nights, allowing for the grapes to ripen slowly and develop flavour, acid & sugars. Shaanxi is located within Central-Northern China between Ningxia & Shanxi with many of the same properties of the latter province, with several similar soil types. The major issue to Shaanxi becoming a wine-making powerhouse is the intermittent heavy rainfall that can fall during the crucial Summer-stage of ripening, so future producers here will need to take that into account by selecting the right grape varieties & most importantly, vineyard sites that features slopes with well-draining soils. The most impressive vineyard operation so far in Shaanxi is Jade Valley Winery, located in the Qingling Mountains, around 1 hour East of Shaanxi's capital Xi'an, the ancient capital of several Chinese dynasties, and the famous home of the Terracotta Warriors. Jade Valley Winery has in recent years hired Californian winemaker Victoria Coleman to assist in the ongoing improvement of their wines. Tianjin municipality is located South-East of Beijing and is home to several government efforts when it comes to winemaking. The most well-known of these is Dynasty Fine Wines, founded in 1980 as a partnership between the local government and French spirits company Rémy Martin. A significant amount of the municipality's land is taken up by the large metropolis of Tianjin city, home to over 15 million people, and much of the rest is low-lying coastal plains unsuited to viticulture, so the vineyards are primarily found to the North & East, bordering Hebei Province. The best vineyard sites are found in the foothills of Yan Mountain Range in the North of the region (which then continue on into Hebei), the south-facing hills here provide drainage and allow for access to more complex soils than the alluvial, waterlogged soils of further South. Any viticultural success in Tianjin is likely linked to it's proximity to two of the largest population & commercial centres in China. Incredible new wine regions of China that show a true vision of expanding terrior and understanding between winemakers & their unique landscapes. Watch for more Chinese wine coverage in the future as China grows to become a huge part of the future wine world! Check out more wine regions here!